Over the last week Christians in two towns near Faisalabad in Pakistan fled their homes as Islamic extremists went on a rampage, burning and looting Christian homes. These riots began after Christians were falsely accused of blaspheming the Quran during a July 25 wedding. On July 30, 60 houses were burnt in the village of Korian and on August 1, in the nearby village of Gojra, 50 houses and a church were burnt to the ground. At least 14 Christians are dead and many more suffering from severe burns and unable to obtain medical help. Several of the 14 dead were burned alive in their homes while Muslim mobs blocked roads in order to prevent the arrival of fire response crews. The authorities’ response to these events has been grossly inadequate. 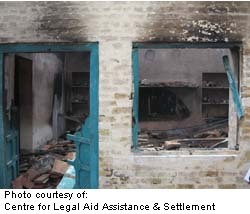 After the Korian attacks, provincial authorities took no action to rein in the rioters or to prevent the attacks in Gojra. Reinforcements were slow to arrive, at one time reportedly leaving four police officers tasked with controlling the mob of thousands of Muslims who were being incited by loudspeakers from local mosques and vehicles. A committee struck to investigate the Korian attacks included no Christians and only after Christians demonstrated for several hours, refusing to bury their dead from Gojra, was any action taken against the rioters or those who incited them. On the other hand, a first information report under Pakistan’s Blasphemy Laws was lodged swiftly against the Christian parents of the bride. Two security officials who played key roles in the inadequate security response have not been suspended or arrested even though they are named in the complaint. Furthermore, Muslim groups held a press conference on August 5, demanding that the complaints against Muslims be dropped and threatening further attacks against the parents of the bride and the Christian community. These attacks follow on the heels of increasing attacks, including previous similar attacks, against Christians and other minorities in Pakistan. Rev. El Shafie intends to follow up on his previous visits to Pakistan by visiting the affected area shortly. Please keep him in your prayers regarding his safety and provision and, if you are able, please assist us with the financial demands of this mission (donation information is provided below). • that the people of Pakistan would be able to live together in peace and harmony regardless of their religious differences and that the Islamic extremists would be exposed and prevented from causing more harm. • the Minister of Foreign Affairs or Secretary of State in your country, demanding that they hold the Pakistani government to account over its handling of Christian and minority rights and insist that it take appropriate and effective measures to stop Islamist attacks.